Sofia Buchuck, originally from Cusco- Qosqo- the mystical centre of the world- or otherwise known as the Inca Capital of Peru. She is the only Quechua singer in the UK as well as playing Andean and Amazonian instruments with her energetic band of professional musicians at main folk and world music festivals. With Latin American and cultural studies; Sofia has completed research in ethnomusicology at the National School of Music in Mexico UNAM, gaining an MA in cultural studies. She is currently finishing an MA in oral history and history research. After living Peru in times of violence, Sofia has worked both at English and Latin American events in the UK, supporting human rights issues benefiting refugees as well as travelling and performing as “Sofia Buchuck and Andean Band”. In her show she shares instruments with talented musicians, delivering haunting sounds of different genders and musical styles, mainly from the “Ethnic groups of the Americas” such as the Quechuas, the Mapuches, Chipchas and Mayas combining native languages with more prominent tongues such as Spanish and English, in London – Moon Town or Diaspora capital of the world, where being different means variety. Her songs reflect themes of identity, exodus, respect for nature and the cosmic energy to celebrate life in itself, reviving and reconnecting people in a community, reinforcing a sense of multicultural development. Poetry is added bringing memories of home and linking both, time and spaces, rural and urban music blends with popular and modern influences available on her different albums with her own compositions and songs of well-known composers such: as Carlos Huaman, Manuelcha Prado, Bola de Nieve, Julio Humala. After singing for over fifteen years in the UK Sofia was the first Hispanic singer to perform at the “Royal Opera House” in Nov-2005 bringing colour and the spirit of the Andes to Coven Garden- of which the Latin American community has it’s pride. Starting singing as a child at the top crown of the trees of her village Quillabamba or Moon Town- Sofia has develop establishing her compact band of top Andean musicians with: Chano Diaz- on panpipes, Quenas, Quenachos, rondador, base, Victor Palomino Mamany on guitar, Diego Laverde on the harp, Kieffer Santander playing the Peruvian Cajon or percussion and Jose Navarro on the armadillo made charango (mandolin type instrument).She has been working for many years through educational projects, benefiting the Latin American community; and recently collecting oral histories from refugees in research for the Evelyn Oldfield Unit to be archived and exhibited at the museum of London 2006-2007. In a community where the arts are at the very highest standards with a variety of artists from around the continent, “Latin Excellence or excellencia Latina” the yearly organisers of the awards event had a very challenging and difficult task on selecting their best representatives. This community is one of the fastest growing communities in London with around a million Latin Americans in the whole of the UK; Sofia is the first Andean artist to be awarded as best Latin American artists 2006 with over 2400 votes. Published literature: * “At the other side of America”- a collection of poems and short histories mainly in Spanish- reflecting issues of love, exile, memories, exodus as well as cross-cultural issues. * “Latin Mermaids” Myths and legends of Latin American mermaids living in between places – London- Latin America- in English- with -Quechua and Maya influences- mainly for children and adults too. 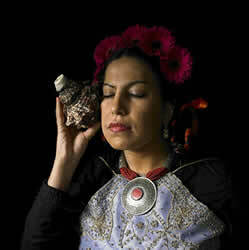 Sofia Buchuck, Peruvian poet and singer based in the UK since 1991, presents- KILLA RAYMI ADORATION TO THE MOON,- A fusion of andean music lead by talented musicians, combining traditional and comtemporanean isntruments such as panpipes, flutes, keyboard, electric guitar, violin and charango. Killa Raymi reprresents the mixed roots relfecting the transculturaization of Latin america, allowing us to feel part of a diverse culture. Killa Raymi birngs the most happy carnivals mixed with regaeton, and yaravis with soul as well as a ritualistic poem paying respect to mother earth “Pachamama” and other pre-colombian deities such as Apus mamas and Apu taitas, sacred mountains. The mytical instruments and contemporanean rythms allow us to celebrate Londons diversity and constrast- homenaje a los migrantes at “la despedida” all songs- arranged by well known peruvian producer Chano Diaz Limaco. Killa raymy involves dancers of scissors and is lead by the evocative voice of Sofia Buchuck- Awarded best Latin American artist 2005/06. Watch her poem ‘Adoration to the Moon’ here. The same way I search to hold on to my origins. Yet they disappear to the unknown space of the wind. The trains run on a threat of silver underneath the city. I travel in them, from station to station. Still unable to reach the end of my destiny. London is dressed in the clothes of crying refugees and the exiled. They have been whispering to the womb of their childhood. Urging to defeat their demons, and cross the sacred border of impossibilities.